Published: Jan. 30, 2015 at 11:55 a.m. Updated: Jan. 30, 2015 at 04:23 p.m.
Last year J.J. Watt famously spent his offseason staying at a friend's home, often sleeping in the dining room, while dedicating all his time to working on his game. This offseason, the Houston Texans' MVP candidate won't bum a room from a friend. Instead Watt said he bought himself a log cabin in the "middle of nowhere," per the Houston Chronicle. "It's really minimalistic," Watt said. "The only thing I have to focus on is training and that's the way I like it. There's no frills, there's nothing to distract you up here." Watt is coming off one of the most dominant seasons we've ever seen from a defensive lineman. 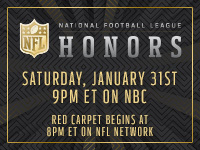 The 25-year-old is up for the MVP and Defensive Player of the Year awards, which will be handed out Saturday at NFL Honors, airing Saturday at 9 p.m. ET on NBC. Regardless of what hardware he walks away with, Watt will spend his offseason isolated in his cabin, training and improving. "It basically is who I am," Watt said. "My friends said if we were to look at a house that's you, (the cabin) is it." Watt added that he plans to build a gym in the cabin's barn. If he's not recreating the training scene from Rocky 4 I would be shocked and disappointed.